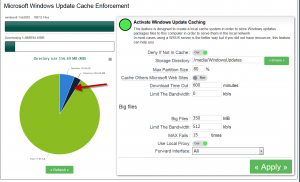 With Artica v2.25.102113 or above, a new feature called Microsoft Windows Update Enforcement allows you to fully cache Windows Updates. 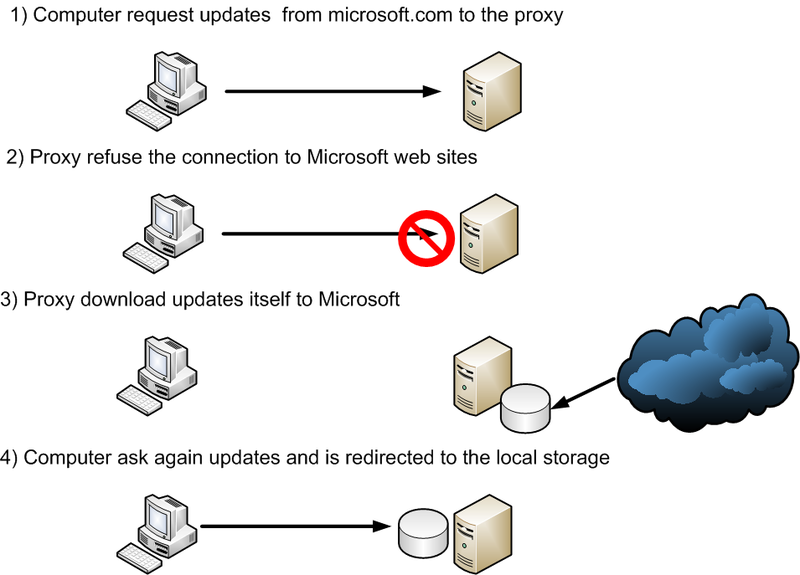 This feature is able to allow the proxy to download itself requested Windows updates in order to server files locally. Since Windows 7, updates are very big ( more then 350MB ), this feature safe bandwidth. 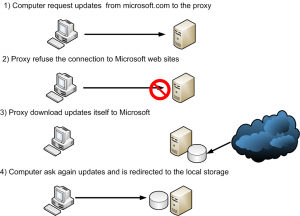 You are able to reduce the download bandwidth rate used by the proxy in order to retrieive updates. 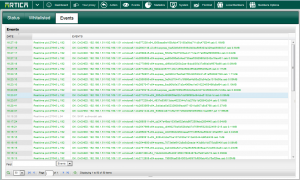 Directly integrated in the proxy, not necessary to create a dedicated machine for this feature. Click on the Windows Update link. 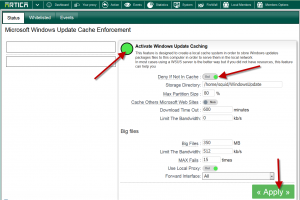 Deny if not in cache : If set, when the requested file is not stored on the local disk, the proxy refuse the connection. 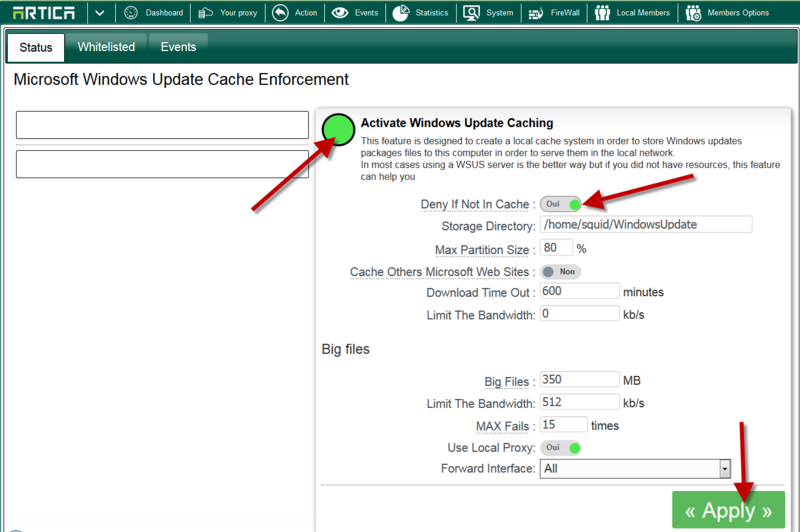 Max partition size : If the partition size that stores the storage directory exceed the percentage value then Artica stop to fetch new Windows update files and allow computer to retrieve non-cached updates files trough Internet. Download Time out : Set the download failed if it exceed x minutes. 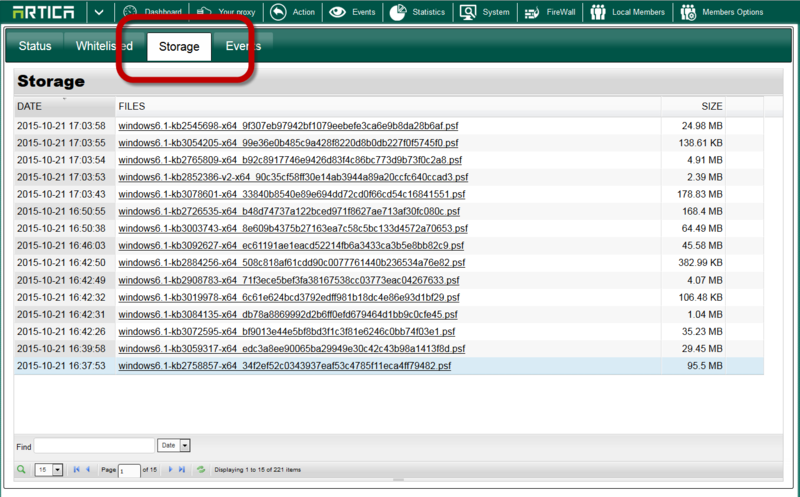 Limit the Bandwidth: limit the retriever service to a rate of kb/s when the file is more than the Big files size. 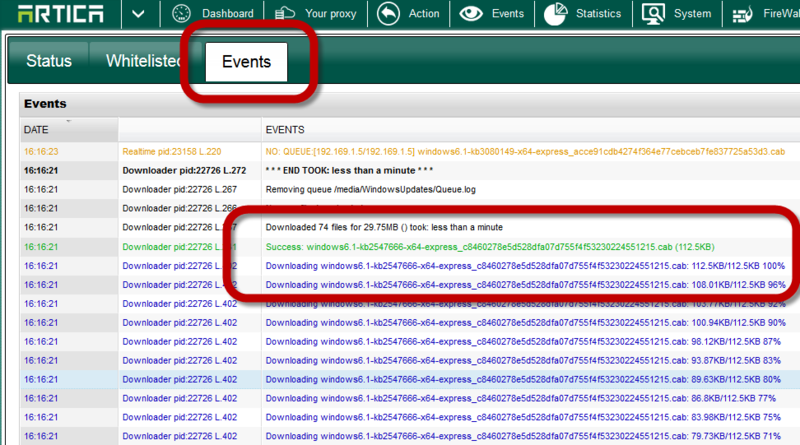 MAX fails : After x download failed, the big file will be saved in blacklist in order to never retrieve it again. 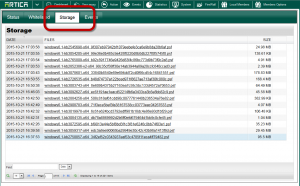 Forward interface: Define the Network Interface to use when downloading files. 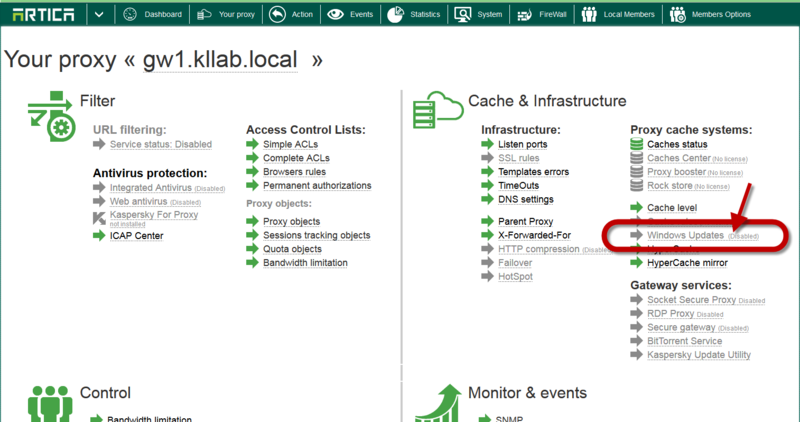 Cached files are displayed in Green. Files saved in the download Queue are displayed in Yellow. Current Downloads are displayed in blue. 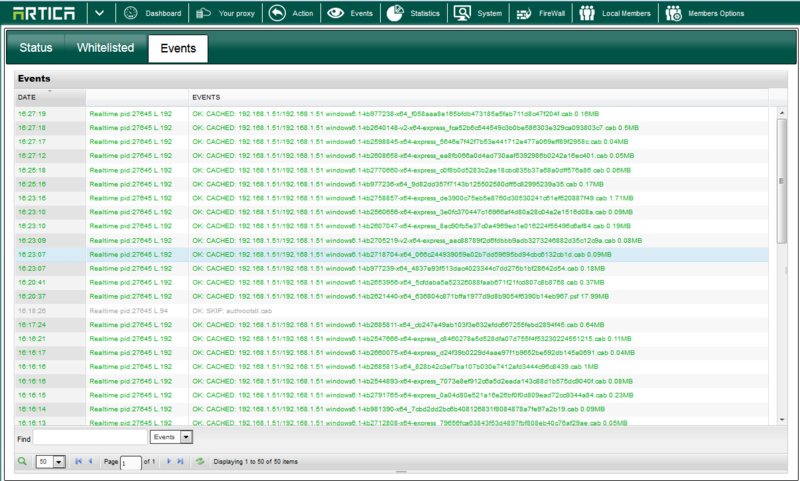 After few times, when all requested packages are downloaded, everything is served locally. 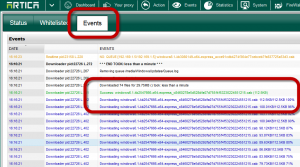 The main section shows you the size of your partition and downloads progress.